Mal. She may be a disappointment to her mother, Maleficent, but in the eyes of her adoring fans, she is just the right amount of evil. 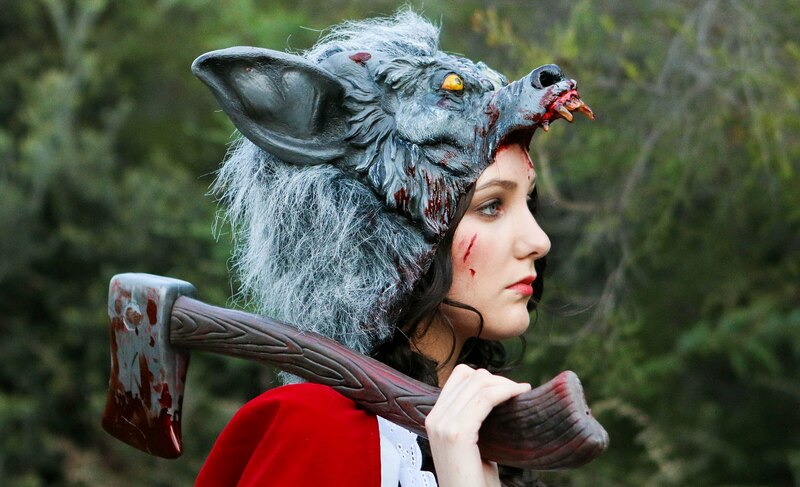 To be honest, it might not be her dark magic attracting so much attention. Her edgy style, confidence and good nature inspires her fans. Of course, the purple hair helps too. We’ll show you how to re-create her look below. 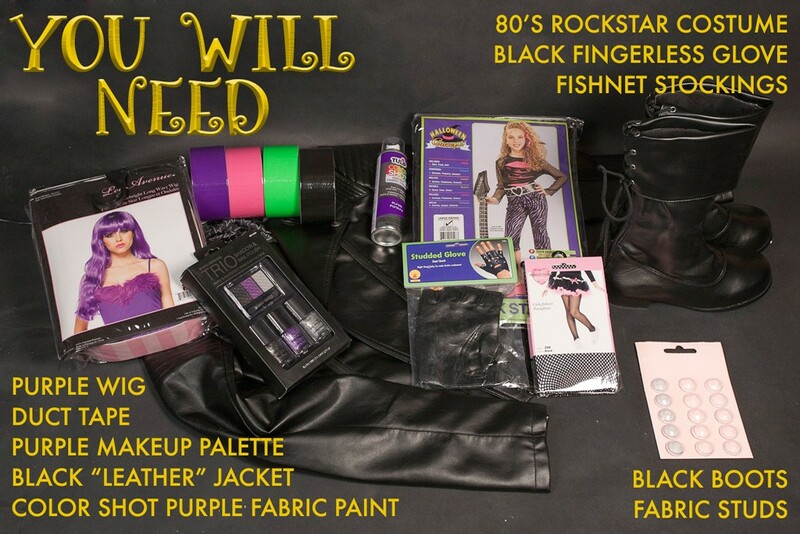 Follow the steps to customize the Mal’s signature jacket, and throw in a few odds and ends to finish the look. Some of these items might already be in your closet. Step 1. Spray paint the jacket with the fabric paint. Use a fabric spray that dries soft. You can test the paint on the back of the jacket to see how it will look when it’s dry. Step 2. 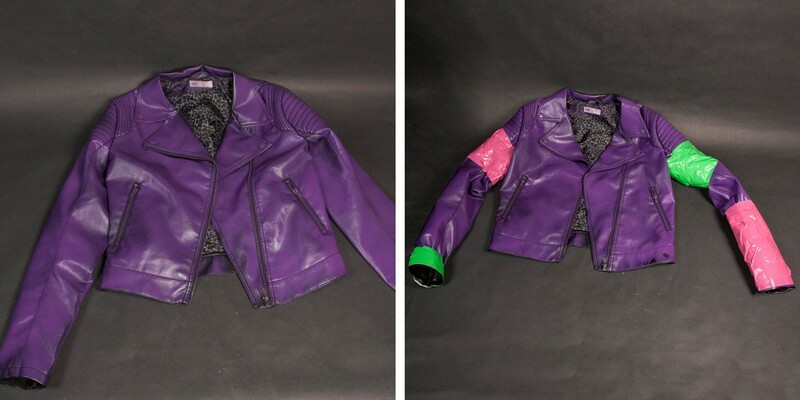 Wrap different colors of duct tape on the arms of the jacket to match the colors on Mal’s jacket. Careful not to make it too tight. Step 3. Make sheets of the purple and pink tape. Starting with the sticky side facing out, wrap purple duct tape around the piece of scrap cardboard. Step 4. Turn the duct tape over and rewrap the cardboard with the sticky side facing in. Step 5. Cut the tape off the cardboard. You will have a large sheet of duct tape to use in a future step. Step 6. Repeat steps 2-4 with the pink duct tape. Step 7. To make the pink flap on the front of the jacket, cut a triangle from the sheet of pink duct tape, large enough to fit the jacket. Step 8. To get the look of studs on the jacket collar, start by inserting the brads through the duct tape triangle. I was able to find larger decorative brads, but regular ones would work fine too. Step 9. Place the brads in a pattern to look like studs. Step 10. Duct tape the flap on the jacket. Step 11. 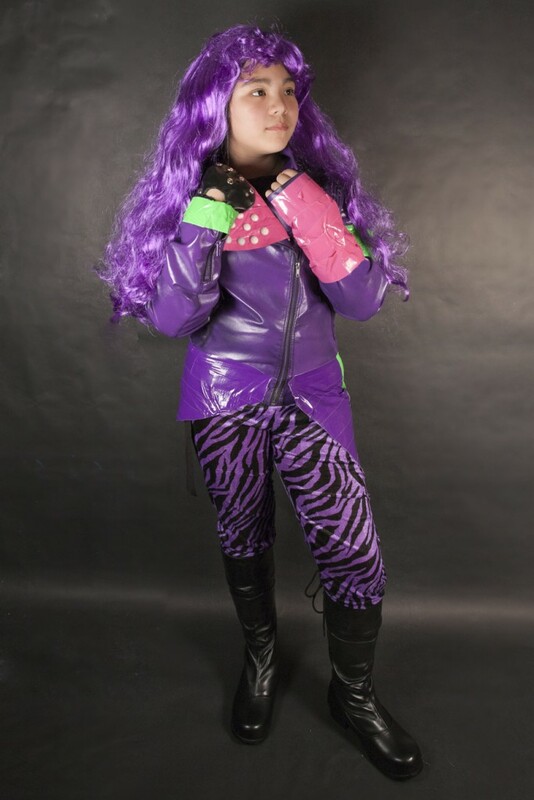 To make the jacket longer, cut up the purple duct tape sheet into pieces and tape around the jacket. Step 12. You can have the pieces meet in the back, where the seam is less noticeable. Step 13. To finish off the jacket add a strip of green duct tape. Once the jacket is complete. 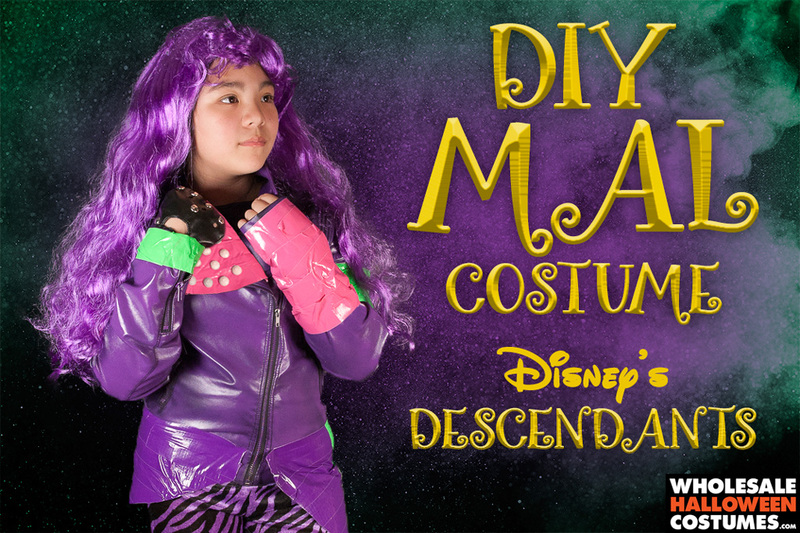 Assemble all the parts to rock Mal’s dark look.